We all make mistakes. You add a little too much of something or maybe not enough of something else. You get distracted, you let just a little too much time go by and things turns out . . . well, less than perfect. Time to buck up and make the best out of the situation. And who knows, you might get something awesome, if albeit different than what you’d planned. Such was the case with a recent star-crossed batch of chicken meatballs. I left the poor guys in the oven just a little too long, so they overshot the point of succulent juiciness they’d been intended for, and instead they became dry and a little blah. I hate food waste, though, so I wasn’t about to throw them in the trash just because I’d turned them into misfits. So what to do with a big batch of dry meatballs? 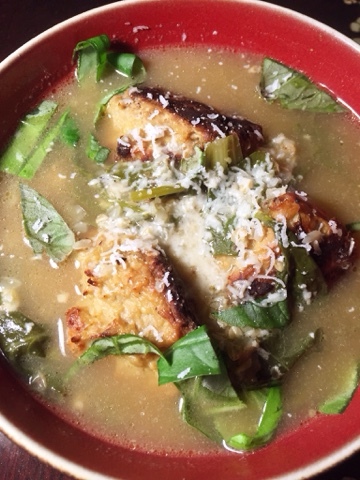 Make their dryness a non-issue: Italian Wedding Soup! A few greens, a little garlic, a few herbs and spices and some chicken stock, and voila . . . in no time the little suckers were restored to glory. Often there will be a little pasta or a grain thrown in this soup. This time I decide to use buckwheat because I just happened to have some I’d previously made on hand. Feel free to use up any grain or plain pasta you have leftover, but I ended up loving the nutty, earthy flavor buckwheat brought to the mix. It’s also gluten free, which makes it a good option if that’s an issue for you (as long as there wasn’t any wheat in the meatballs). If you don’t have any pre-cooked grains and taking up space in your fridge, you can cook some directly in the stock, just give it a little extra time. This soup was so hearty and satisfying that it has earned a regular spot in the repertoire in its own right. And like pretty much any sauce or soup, it’s even better the second day. 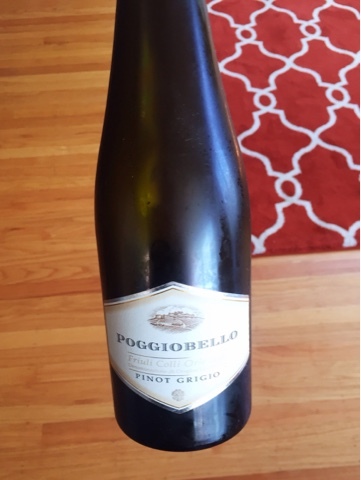 Serve with a fuller bodied Pinot Grigio like this one from Poggiobello. It has more stuffing than your average Pinot Grigio to stand up to the earthy flavors from the Parmesan and buckwheat, and the savory meatballs. It's bursting with bright citrus, hints stone fruit, light spice and lots of saline minerality. Albariño also made a solid match. 1. Heat olive oil in a large pot and add a pinch of red pepper. Add the greens, garlic, the vinegar, mustard, and a splash of lemon juice, toss and sautée until green are just wilted. 2. Add the chicken stock. Bring to a boil, then reduce to a simmer. Add the meatballs, the buckwheat, the dried oregano, and Parmesan cheese. Season with salt and pepper to taste. Simmer for 10 to 15 minutes to allow the flavors to blend. 3. Taste and adjust seasoning. Serve and garnish with basil strips and more Parmesan cheese.